In this post I am going to use Microsoft Unity Inversion of Control container to resolve the dependencies for the ProductService implementation. Most developers will already be familiar with the concept of Dependency Injection and will probably have used an IOC container such as Unity or Castle.Windsor at some point. In order to use Unity to resolve the dependencies in a service implementation a few steps must be taken to wire up Unity with WCF. This post will walk throught the steps to do this. I have created a new project to hold all the DI related stuff. You may wish to put it somewhere else, which is fine. Into that project I have a added Unity via NuGet. The fisrt thing to do is to create a static wrapper for the Unity Container so we can be sure we are getting the same Unity container whenever we need to use it. The DIWrapper provided a static getter returning the UnityContainer. As it is a static class the constructor is guaranteed to run only once and ensures that a new UnityContainer is created. This same container will be returned whenever a call to DIWrapper.Container is made. A service host does exactly as the name would suggest. A service such as the currect Prodcut Service can be hosted on the standard service host without any issues. Once we want to use Unity (or any other IOC container) we need to extend the ServiceHost functionality in order to resolve the dependencies in the service implementation. WCF uses a factory pattern to provide a layer of indirection between the hosting environment and the concrete type of the service required. If you don’t specify which ServiceHostFactory to use, you will get the default factory that returns an instance of the default ServiceHost. If you do not specify a factory in the .svc file you will encounter the following error when trying to use the service. This is because the default behavior for WCF is to call the parameteless constructor, but if you are using constructor injection for the dependency the service implementation will not have one, so WCF does not know how to instantiate the service. Obviously this factory does not exist so we had better create it. To do so we extend System.ServiceModel.Activation.ServiceHostFactory. The new ServiceHost functionality is again very straight forward. System.ServiceModel is extended and a single method is overridden. Inside the overridden OnOpening method a new UnityServiceBehavior is created (which we will create next) and added to the UnityServiceHost before the OnOpening method on the base ServiceHost is called. The System.ServiceModel.Description.IServiceBehavior interface provides a mechanism to extend or modify some aspect of an entire service. To use Unity with WCF we need to add some custom endpoint behaviour. ApplyDispatchBehavior can be used to change run-time property values or insert custom extension objects such as error handlers, message or parameter interceptors, security extensions, and other custom extension objects. In the UnityServiceBehavior class ApplyDispatchBehavior is used to assign a custom InstanceProvider to the service endpoints.The InstanceProvider in this case is our own UnityInstanceProvider (the implementation of which is shown below).It is the InstanceProvider that will actually use Unity’s funcitonality to resolve the dependencies in the service impementation. The behaviour of the Validate and AddBindingParameters methods does not need to change and so have empty implementations. This implementation of IInstanceProvider allow control over the instantiation of the service class. Our aim is for Unity to resolve the service type (ProductService in this example) and its dependencies. In the UnityServiceBehavior constructor a new UnityInstanceProvider is created and the Unity Container from DIWrapper.Container is assigned as the Container. The GetInstance method then calles Container.Resolve(ServiceType) to resolve an instance of the required type. This is where Unity resolves the dependencies and returns an instance of the Service type with the dependencies satisfied. WCF can now happily use this instance for the service. Note that there is no paramaterless constructor, so this service can no longer be resolved via the standard WCF ServiceHost. I have kept the service implementation simple and just moved the logic that was there to the new repository. Description = "A nice product"
Finally we need to configure Unity in the Global.asax of the ServiceHost. We are going to tell Unity to give us back a ProductRepository instance whenever a constructor is expecting an IProductRepository. Now we are all ready to run the service. In the next post I will look at using Unity to resolve Channels for the MVC client so we can just inject the service interfaces into the MVC controller, removing the need to call the Channel factory code from the previous post each time we want a new Channel to consume a service. In a previous post I talked about how it was possible to set up .Net dependency management in TeamCity using NuGet. In this post I will cover the steps required to create a NuGet package as part of a TeamCity build, and publish it to TeamCity’s own NuGet package source server. It is not uncommon to want to reuse a .Net project in another solution, maybe some common data access code. This would mean a bit of a maintenance headache when trying to keep things up to date and versioned correctly. 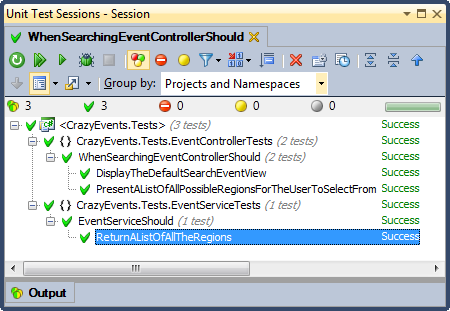 NuGet and TeamCity have now made things very easy. Create a Nuget package for the project when it is built in TeamCity and publish it to TeamCity’s own Nuget package server. This package can then be picked up and used in any other project as a dependency like you would use an external package from the NuGet official package source. 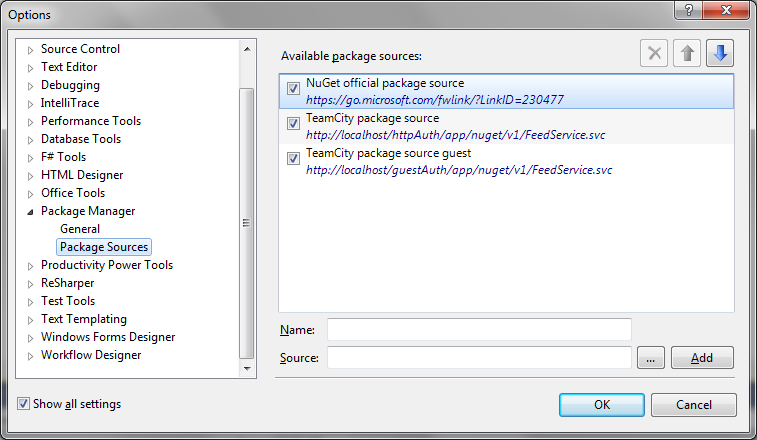 Since version 7, TeamCity has been able to host its own Nuget package feed. To enable it, head over to TeamCity’s Administration page and select NuGet Settings. You will be presented with the URL’s for the NuGet feed. The feed URL will be added in Visual Studio and TeamCity as a package source to allow you to use the packages you create. If you want to turn on the public feed you will need to enable Guest login for TeamCity. It is possible to create a NuGet package directly from a .csproj file in TeamCity. However if the project from which you wish to create the package has NuGet packages itself you will encounter a couple of errors after setting up a build step and attempting to run the build. nuget pack: Specifying SolutionDir in properties gives Exception: An item with the same key has already been added. This looks like it is a Nuget error. An issue has been raised here but at the time of writing it has not been actioned. If anyone has a solution I would be very interested to hear it. Don’t despair at this setback. Even if this approach worked correctly it is a bit of a blunt tool. Much better is to use a .nuspec manifest to describe the package we want to build. Most of it is straight forward and is covered in the NuGet documentation. It doesn’t matter what the version number you put in. It will be replaced by the build number from the TeamCity build. 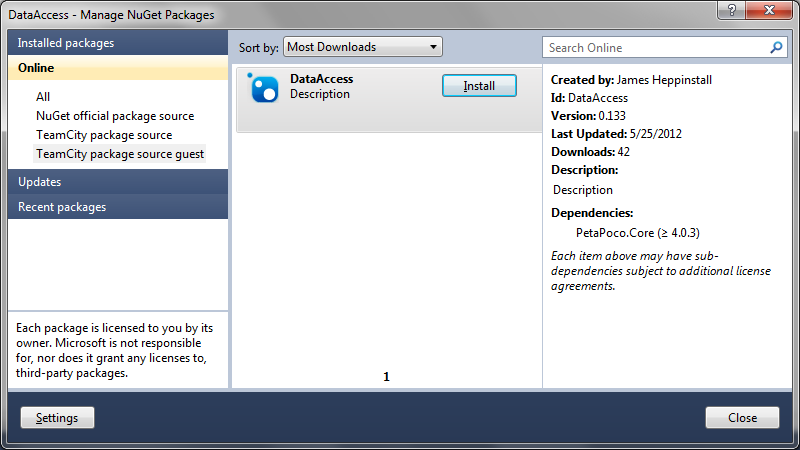 The dependencies section should contain a list of the NuGet packages for the project. If you are unsure which packages your project uses the best thing to do is to look in the project’s packages.config for the correct name and version. Remember that a NuGet package is not just limited to dependencies. It is possible to create a package that contains an entire project structure with code and configuration, including scripts to perform data transformations along the way. So you could create a template package for your organisation’s web site development. Now we have the .nuspec file the next step is to create a new build step for the TeamCity Project. Simply select a Runner Type of NuGet Pack, add the path to your .nuspec file and you are good to go. I have selected to publish the package to the build artifacts. This can be useful for audit-ability. 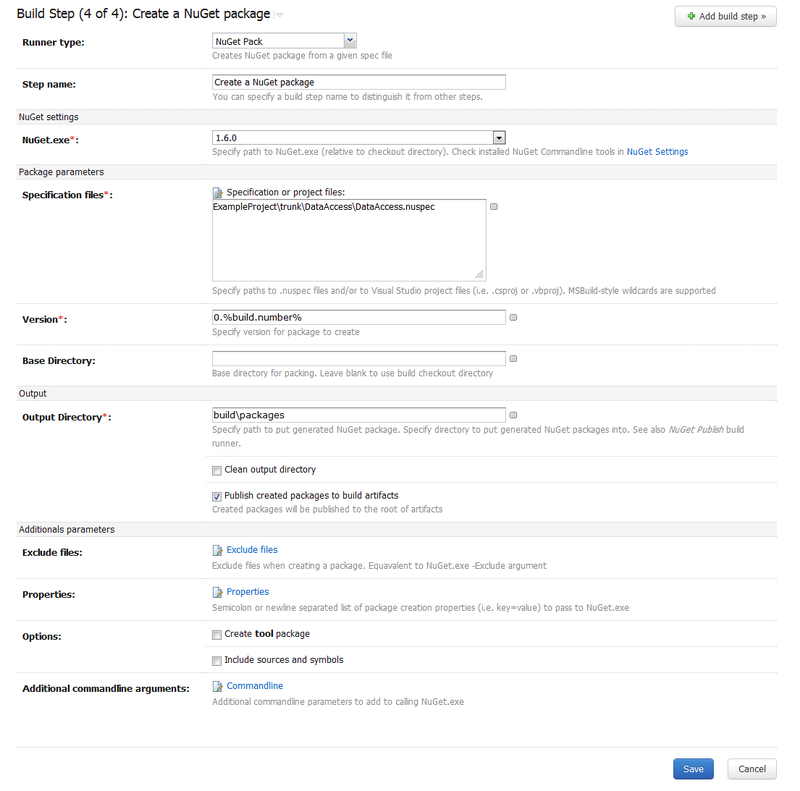 Run the build and check that the Package is created in the build artifacts. If all is good the package is ready to be used in Visual Studio. From Tools | Library Package Manager | Package Manager Settings and select package sources. Add the TeamCity feed URL you wish to use, either authenticated or guest (I have added both for illustration purposes). Of course you should use the correct server name as you will probably not be running TeamCity on your development machine. Now when you go to Manage Nuget Packages for a project you will be able to select the TeamCity package feed and see the Package you have just created, ready to be added to a new project. And that’s all there is to it. NuGet and TeamCity make dependency management for your .Net code base very simple. Before the introduction of Windows Communication Foundation (WCF) in 2006 there were lots of different Microsoft technologies for building distributed systems. ASP.NET Web Services (ASMX), Web Service Enhancements (WSE) extensions, Microsoft Message Queue (MSMQ), the Enterprise Services/COM+ runtime environment and .NET Remoting to name the key ones. Microsoft were keen to point out that there was nothing wrong with these technologies, simply that there are too many of them. Building a distributed system required you to pick one of them as a fundemental technology which would send you down a specific technology strategy. WCF is a single programming model that unifies all of the above approaches and more, and allows for a single technology choice to be used to support many different distributed systems scenarios. Don’t be put off by the reference to the often over hyped service orientation. WCF services can be used in many situations. It is often thought of as being too”enterprisy” for small applications. This is not the case at all. Services can be hosted in applications (Console, Winforms, WPF) as well as IIS and even a Windows Service. This opens up lots of possibilities for developing distributed applications. Many message formats are supported, including SOAP, plain XML and JSON. New formats are added as they gain traction within the industry. A – Address: Where is the service? B – Binding: How do I talk to the service? C – Contract: What can the service do for me? You define a contract and implement it on a service – The language may be new but the concepts will be familiar. A WCF contract is an interface that defines service operations. The service implementation is simply an implementation of that interface. You define a service binding that selects a transport along with quality of service, security and other options – This is usually done in configuration, but can be done in code if required. You deploy an endpoint for the contract by binding it to a network address. Configuration again. Tell WCF which contract interface should be associated with a particular endpoint. Don’t worry if some of the terminology or concepts are new to you, we will cover these in more detail in the next section. Lets go ahead and create a new WCF Service Application project in Visual Studio, either in a new solution or an existing one, it doesn’t really matter for the purposes of this example. Be sure to target .Net3.5. There is a reason for this as .Net4.0 has lots of features to simplify configuration, but it is not that helpful to have lots of things defaulted behind the scenes when we are trying to understand how things work. Visual Studio helpfully(?!) creates a service for us named Service1. A quick rename and we are done, right? Not quite. Although this service would work correctly, the way it has been created would not really be of any practical use in any but for the smallest of applications. The service implementation is in a code-behind on the .svc file and the interface is in the same file as the data contracts (the service model). Lets just delete the files we don’t want and start again. Start with the code-behind file Service1.svs.cs and IService1.cs. Lets leave the Web.config for now as we can reuse the configuration already in there. If you were writing a full size application you may well want to structure your solution into several different projects for the different parts of the application. For this introduction I am going to use folders. Now we can implement the interface so the service can do something. I have given it a trivial implementation. In a real application the service would be responsible for doing something interesting such as performing some calculations or getting some data from somewhere. The next step is to tell the .svc file to use the new implementation we have created. Rename the file to productService.svc and edit the contents to point to the implementation. We only have the Web.config to go before we have a working service. 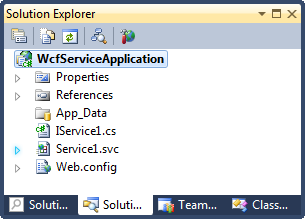 Open Web.config and find the system.serviceModel section which contains the configuration for the WCF services. In the system.serviceModel there are two further sections: services and behaviors. name attribute – this should match the service attribute from the ProductService.svc, which is WcfServiceApplication.Implementation.ProductService. behaviorConfiguration attribute – this should match a service behaviour. We havent encountered one yet (its coming up in the behaviors section) so lets just change the value to WcfServiceApplication.ProductServiceBehavior in anticipation. endpoints – As mentioned earlier, an endpoint is how a WCF service communicates with the outside world. A service can have one or more endpoints. Our example has two. Lets have a closer look at the first one. address = “” – this is a relative address, which means that the address of this service will be relative to the base address. This is the most common address but can be different. It is also possible to add a base address if you want things to work differently. A good introduction can be found here. binding=”wsHttpBinding” – a binding is used to define how to communicate with an endpoint. It has a protocol stack that determines things like security and reliability from messages sent to the endpoint. It describles the transport protocol to use when sending to the endpoint (HTTP, TCP etc). It also describes the encoding of the messages that are sent to the endpoint (text/xml etc). WCF has some binding to choose from that cover a variety of scenarios. We are using wsHttpBinding which offers good support for interoperation with other services that support the WS-* standards. Other bindings can be used depending on whether you need backwards compatibility with old asmx style services, or whether you want high performance when building WCF services that are also to be consumed by a WCF client for example. More information about bindings can be found here. Contract – this should be changed to the location of the contract we created early, which is WcfServiceApplication.Contract.IProductService. serviceMetadata httpGetEnabled=”true” – this enables metadata exchange and also allows the WSDL to be access by a special URL (which is the service url with ?wsdl at the end). You don’t always need metadata exchange, but we will be using it later. serviceDebug includeExceptionDetailInFaults=”false” – do we want to show useful debugging info? The default is false and will keep it that way. This may be useful if you are debugging a service but should not be used in a production environement. Thats it. We are ready to run the service for the first time. The easiest way is using the WCF Test Client. 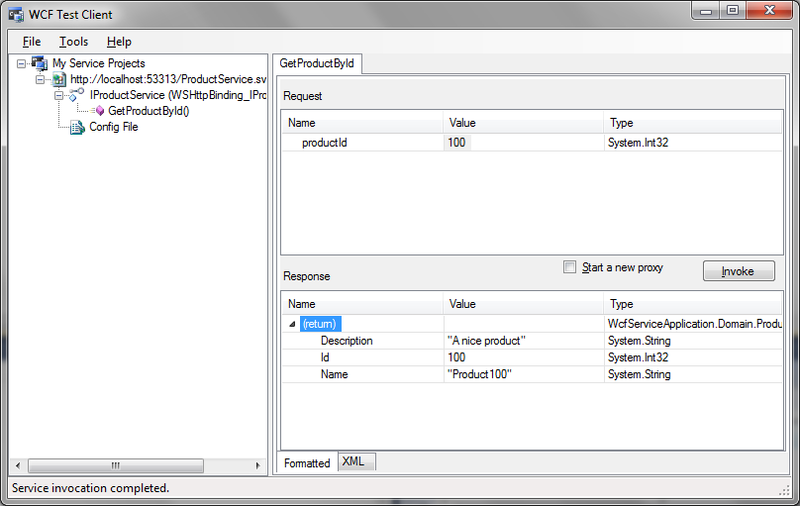 highlight ProductService.svc in SolutionExplorer and hit F5. All being well WCF Test Client should load with the service visble. If you get any errors when you load the service it is very likely that there is a typo somewhere in either the files or the web.config. Under the service you should be able to see the service along with the single service operation GetProductById(). Select the method to bring up the request and response panels for the method. You should be able to add a product Id (any number will do) and hit invoke to see the outcome. That’s all there is to it. Of course there are a lot more configuration possibilities for more advanced scenarios, and we will cover some in future posts. In the next post I will cover how to create a client application to consume the WCF service we just created.